The Jordan Movie Blog: Survivor: Siberia? I remember when Survivor premeired way back in 2000 and I dismissed the show as a boring idea for a game show that would probably be canceled mid-season. I did keep watching though and eventually got hooked by the unique strategy aspects of the game. 17 seasons later I am still along for the ride having watched every SINGLE episode of Survivor. I'm pretty sure it's my taste for competition (and enjoyment of Jeff Probst's wry wit) that keeps me coming back each season. 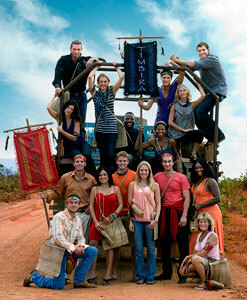 Tonight, Season 18 begins with 16 new castaways in the same typical warm weather style location (South America). While the producers of the show have tried to spice things up over the years with casting gimics (old vs young, asian vs black vs hispanic, etc...), hidden immunity idols, exile island and more, one constant remains. Survivor is always contested in a warm climate location. What I would love to see before the show finally ends it's run (producers have comitted to at least one more season) is a switch to an extremly COLD climate location. It would be great to see Survivors deal with the opposite extremes of survival by being forced to build shelter to shield them from the cold. Of course producers would have to give contestents some sort of comfort (warm clothing, fire, etc...) to keep them from dying, but a switch to cold weather would open up so many possibilities. Imagine all the challenges that could be devised in a snowy climate (sleding, skating, snowball fights!). I really think this would be a major change that could keep the show fresh going forward. The ONE reason this won't happen though is pretty simple. Producers would not want the contestents that are easy on the eyes to be dressed in multiple layers. A Survivor set in Northern Alaska would not allow for outfits like this. A workaround would be to have cabins or "igloos" set up that are warm inside so we could see less clothing at times (but still keep the winter challenges in play). I also think that pretty-boy Probst would not sign on for a cold-weather season. Unfortunately we're back in the sun and heat for Survivor Tocantins tonight. At least Probst is claiming that the cast is really good this time around.